This letter is asking others to donate money tot he Berry Schools so one student can attend for one year. Anything would help. 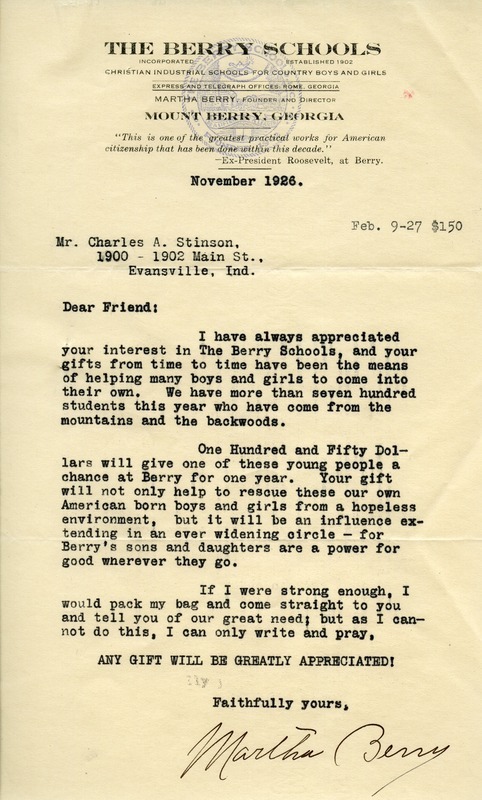 Miss Martha Berry, “Letter to Mr. Charles A. Stinson from Miss Martha Berry.” Martha Berry Digital Archive. Eds. Schlitz, Stephanie A., Mackenzie Liberta, et al. Mount Berry: Berry College, 2012. accessed April 20, 2019, https://mbda.berry.edu/items/show/5928.